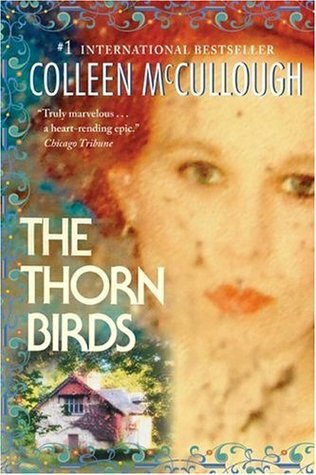 For years our former Hoarder Jackie has been begging me to read The Thorn Birds. And years ago, I thought I found the audio for it, but it was in an unsupported format so I couldn’t listen to it. So then I bought the paperback so at least it would be there, on my shelf, ready for me to finally read this modern classic when the right time hit. I hadn’t read it before, nor had I watched the mini-series that was wildly buzzed about in the 80’s. I can clearly remember the brouhaha surrounding it back in the day with the handsome Richard Chamberlain playing the role of Father/Cardinal Ralph de Bricassart. I’m sure I wasn’t allowed to watch it, (knowing my mom) because I knew of no scenes, none of the characters, etc. I also do not remember seeing the book laying around our house, although that paperback cover from 1977 feels vaguely familiar. Anyway, my parents were not big readers, it was only me from the beginning of time that was the voracious reader – even back then. And, this wasn’t the kind of story that my mom would have reached for – I’m sure she would have thought it blasphemous. Anyway, Jackie called to say a co-worker let her borrow the DVDs and we could watch it together on another one of those ideal weekends when her husband and son were off at a soccer tournament. Our mini-series, TV series, books-to-movie watching weekends are wonderful things. Those times when her husband is away, either at an historical reenactment event, or a soccer tournament, make for fantastically fun days where we order Thai food and settle in on the couch for an entire day of TV watching. We’ve watched entire seasons of Downton Abbey, Pride and Prejudice (the one with the real Mr. Darcy, Colin Firth) some of Poldark, etc. etc. The comfy pants, reading socks or slippers and tons of snacks are spread out and away we go – hours of enjoyment. So it was another soccer tournament weekend that allowed us to watch The Thorn Birds in all of its 80’s cheesy drama and glory. That Sunday couldn’t have been a better day for it too since the skies opened up and after throwing down ice pellets, it changed to pouring, pouring, pouring, non-stop rain. (I wished I had taken of picture of her backyard – it was a becoming a lake and I believe ducks were swimming around in it!) Watching the 1983 mini-series with 2018 eyes only bothered me with the scene where Father de Bricassart first meets Meggie Cleary when she’s around 6 or 7. That was a little creepy. Come on now. But after that….I was hooked – even through all of the cheesy overly dramatic acting! I’m certain I wasn’t allowed to watch it when it first came out because it would be thought of as completely inappropriate, but I didn’t feel that at all when watching. Perhaps the relationship between Meggie and Ralph was blown apart to be greater than it actually was. I don’t know, all I do know though is that I couldn’t stop watching. What an epic saga! Dramatic with plenty of bad acting, yes, but epic and grand! Sadly, with one hour and a half remaining, I could no longer ignore the pleading messages from my family wondering if I’d abandoned them. (This mini-series was LONG!) I gathered my things and went home, immediately pulling the book from my shelf and finding close enough to the part in the show where we had left off. I have to say I enjoyed being able to watch both the mini-series and also read the book. Of course the book is always better because there was a lot of internal dialogue I was able to read and there was more depth there, but I found myself a little disappointed in how it ended. At first, I wanted more closure in how Meggie and Ralph’s story ended. It was very separate and distant from each other, so I felt a little unsettled by that. Last night, Jackie dropped off the DVDs so I could finish watching it. I just had to know how it ended, and if it ended differently from the book. It did, and I thought I preferred that ending more, yet, I’ve kept thinking about it and I think I understand why McCullough ended their story how she did in the book. Honestly, I have been thinking a lot about this story, the book and the mini-series! I told you I was consumed by it! 😉 An epic, multi-generational saga for sure. It was exactly what I needed right now to shake off some of the terrible, horrible, no good, very bad reading experiences I’ve been having. Have you read or watched The Thorn Birds? I thoroughly enjoyed how I experienced it with this great mix of the TV drama and depth and detail from the book too. Read it, watched it…still have the paperback. Might read it again but so many books on my tbr list. Just finished Girls Burn Brighter – good read. Hi Eve! Yes! I read Girls Burn Brighter too – very good – sometimes hard to read, but also an uplifting story! Wow, the series adaptation must have stayed pretty faithful to the book if you could just pick it up and read on from where you were up to without missing a beat!! That’s very impressive!! Yes! I pulled back in the book to where I had already watched parts, just to make sure I was where I might have left off. In many cases, or really, in most cases, the dialogue written in the book was spoken verbatim in the show! Verbatim! And, in many cases, while the dialogue may have been verbatim -the location of where they said it was different. That I was able to discover after reading to the end and then going back and finishing watching the mini-series! So, truly, it was such an excellent way of experiencing this story. 🙂 Loved it! I am so happy you finally had a chance to enjoy both the book and the adaptation! This is a book I keep meaning to revisit — I read it when I was pretty young, and always wonder how my adult self would respond. (My 13yo self loved it!) I know my mum watched the miniseries too (we had that memorable golden-y yellow 70s edition at our house) – and I am sure I saw some of it with her… but I remember nothing. ☺️ I am so happy your awesome day with Jackie was also a perfect literary balm!! We already chatted about this on Twitter so you know that I did watch the mini-series as a teenager and I had picked through the book to find the naughty parts by then too *grins* but I really did have to make a point of reading the book properly. Your all-day viewing sounds like SO much fun and I was wrenched by the fact that you had to leave before the ending! Nooooo. But at least you did get to finish it in the end. Phew. I also really liked McCullough’s The Ladies of Missalonghi too (which was supposedly a take on LMMontgomery’s The Blue Castle) which is much skinnier (and no naughty bits). I wonder if, 30 years from now, the younger generation will be giggling at “Big little lies” on some rainy Sunday, wondering how we ever took such productions seriously. That’s funny to think about BIP! Yes – watching Big Little Lies today had some eye-opening moments, (I’ve never seen so much of Nicole Kidman! 😉 ) just as I wonder if those in the Thorn Birds felt like those at that time! Because now it seemed so tame and almost cheesy/funny to watch!